As always, your aid is greatly appreciated. Bonus: I’m not quite done with Christmas. I think the graph machine is tracking temperature and humidity in the building to ensure they are within optimal ranges for storing books and paper. Can’t say much about the print out. The dial in the second picture is a temperature / humidity recorder. Paper disk turns, either on a 24-hour or 7-day cycle, the silver arms each are tipped with a pen point filled with liquid ink that marks the paper disk as it turns. One arm does temperature; the other humidity. Once a day or week, the paper disk is replaced with a new one and ink is added to to the pen with an eyedropper. The same kind of device was used in other temperature/humidity-sensitive environments such as computer facilities. Since there are shelves of books behind the (obviously posed) third photo, they may have been digitizing the library catalog. You can tell it is posed because she is looking into space rather than keypunching from copy. In that third picture, isn’t she looking at the spines of the books on the cart? The Hollerith cards and listing are likely the library’s circulation system of the time. 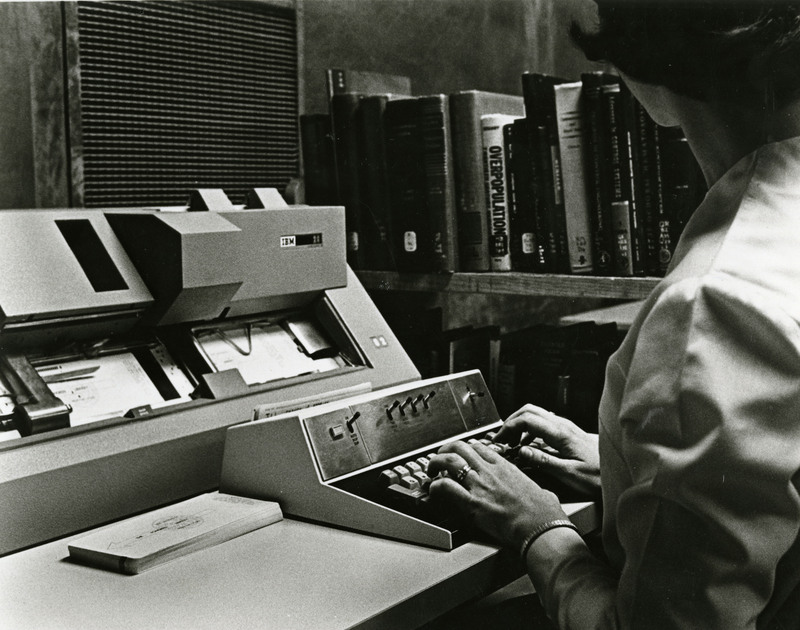 When a book was checked out, the ID card information and book number would have been recorded, then punched onto the cards. The cards were read by a program that produced lists of books circulating, overdue books, fines owed, etc. IIRC, the list was consulted when a student checked out a book to see how many books the student currently had checked out or if fines were owed. 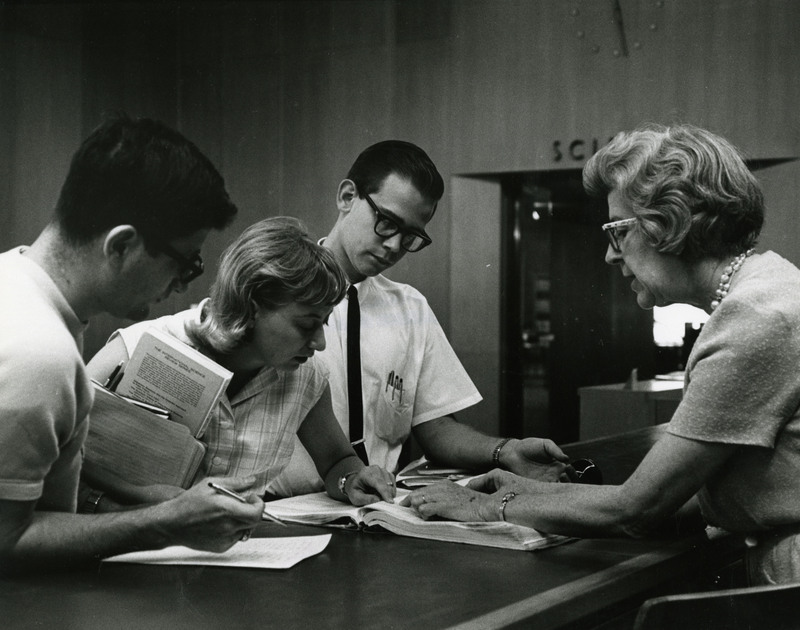 By 1969, Rice ID cards had the student’s ID number Hollerith-punched into the card and each book that was allowed to circulate had one of the Hollerith cards in a pocket in the book. When a book was checked out, the student’s ID card and the book’s card were inserted at the same time into a device that recorded the information (in the holes) from both onto (I THINK…) magnetic tape, eliminating the punching of the circulation records (unless the reader was broken in which case the process reverted to the older manual process). I remember that card system, but I don’t know if it was from my undergraduate days at Rice, or if it was from my high school or middle school research expeditions to Fondren. I also remember using the bound printout at the circulation desk to see if a book had come back in, and that would have been after fall of 1972 when I was enrolled at Rice. I would not have been in the library often enough to use that before I was an undergrad. My mother introduced me to Fondren when I was 12. She was not a Rice alum, but she worked at M.D. 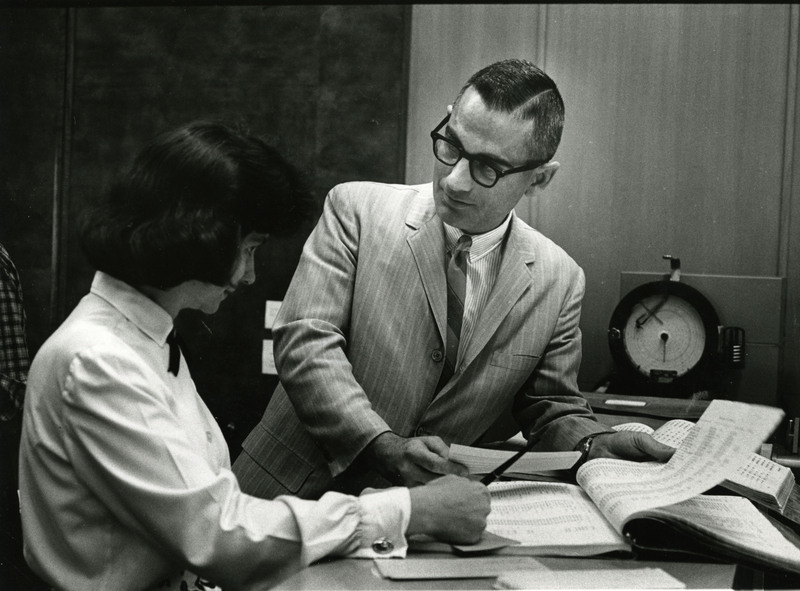 Anderson as a research chemist for a number of years and got in the habit of using Fondren to support her work back in the early 50’s. 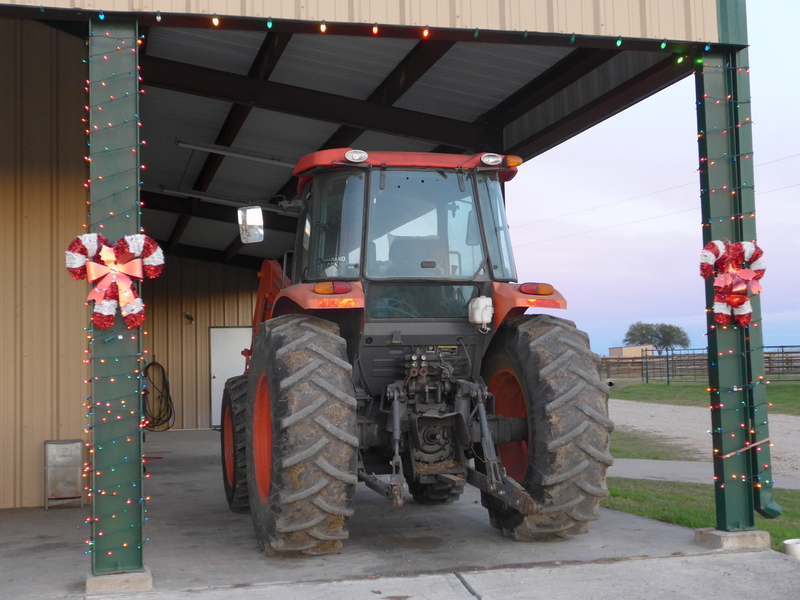 Nice tractor… A/C in the summer, heater in the winter? I wish! But it is indeed a very nice tractor. The keypunch picture may have been taken in Acquisitions where additions would have been marked with call numbers, “property of…”, checkout pocket, etc. At some point, a card would have been punched containing call number, author, title, and such. The first picture is of the more or less “Reserved” section which was to the left of general circulation as you entered the front door. Professors put books which were needed for a class, but which were in short supply in the library, in that section so no one would hoard them for a semester. They could be checked out for a couple of hours but could not leave the building. I worked for that lady for two years but can’t remember her name. Her son was in Baker and graduated in 65 or 66. The man in the in second picture is James Mayfield, who was head librarian for a while, and an “interesting” character to say the least. Could you define interesting in this case? First photo. I believe that is Elda Brewer (Mrs. Benjamin E. Brewer Sr.) Rice Grad of about 1930, mother of 3 Rice Grads: Ben Jr., Christine, & Paul. Thanks! Ben Brewer the architect? Yes, Ben Brewer the Architect, my late husband. Are student number still the social with an added digit? Not for quite a few years! I figured not. Technically illegal, hence the added didget. Another possibility for the printout is a listing of periodicals. I seem to remember when I worked at the Library in the later ’60’s and ’70’s that we had a printout like that with periodical titles and the dates of the Library’s holdings. So if you needed an article from a 1955 issue of IEEE Journal of Whatever, you’d look in the printout to see if we had that journal in that year. Library research is SO much easier now!